Jack has been a Cooperator of the Hereford NRCD for many years. He was appointed to the Board of Supervisors in 1991. Although, as in the case of many ranchers, Jack has had an outside job for most of his ranching career, he has been a full time rancher for the last 20 years. During this time he was briefly President of the Coronado RC&D, was one of the four local individuals selected for the 1999 Tri-County Study of Sustaining and Enhancing Riparian Migratory Bird Habitation on the Upper San Pedro River and for several years was the NRCD representative on the Upper San Pedro Partnership Advisory Committee. Jack is a committed conservationist. 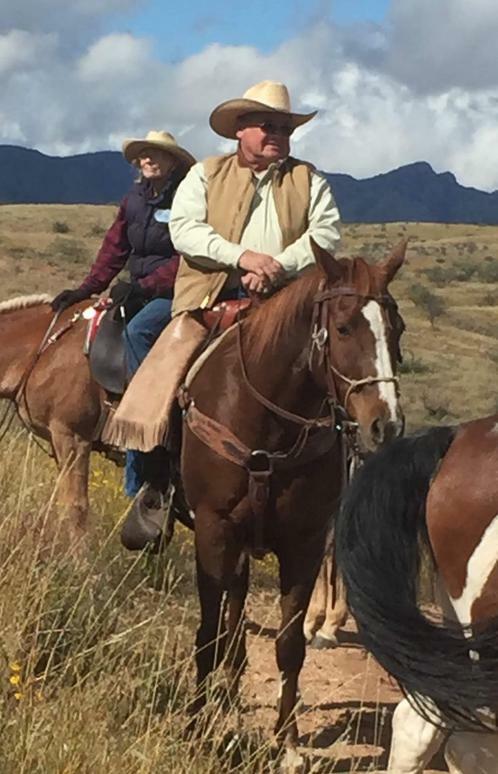 He and his family own and operate a ranch along the Mexican border between Naco and the San Pedro River, which was originally homesteaded by his wife's family well over a hundred years ago. He has consistently followed proven conservation practices on the ranch as did his mother-in-law before him and now his son. Over the past 60 years, with the help of the NRCS and its predecessors, the Ladd family have root-plowed or grubbed over 5,000 acres in an effort to enhance the infiltration of storm water runoff and to eliminate mesquite and brush. They have also built hundreds of dikes to slow and spread the runoff. Jack plans to continue this work as long as he is able. Senator Gail Griffin has been a resident of Arizona since 1968 and currently resides in Hereford, Arizona. Mike and Jeannie Hayhurst purchased the Brookline Ranch in 1988. When it was purchased it was extremely overgrazed and all the improvements were in a state of complete disrepair. They started with a herd of less than 20 cows and have built the ranch to a 100 head cow/calf operation. They’ve worked with the NRCS to develop deferred grazing plans, pasture rotation, improved waters, internal fencing, and brush control to make the ranch very productive. our national security. They have been particularly successful with the use of SPIKE in the eradication of brush.Their commitment to range restoration led to them being selected the 2006 Range Managers of the Year by the Society for Range Management. Mike, a chemist by education and a long time school teacher and high school football coach, has served on the Hereford NRCD Board and has been their representative on the Upper San Pedro Partnership. Mike is a native Arizonan and comes from an Arizona territorial ranching family. Steve Boice became an Advisor of the Hereford NRCD in 2018. Steve was raised on the Empire Ranch in Sonoita, Arizona. He worked at heavy construction, contracting at various mines in Arizona for many years. He is currently co-founder of Horse'n Around Rescue in Hereford, Arizona. Jeri Ligon was raised in the West Texas city of Odessa, which is in the middle of the Permian Basin oilfield. Her grandparents also lived in Odessa. Her grandfather was an oilfield contractor and often took one of his older grandchildren to whatever location he needed to visit. Many times Jeri went with him to open and close the ranchers' gates that they drove through. Her grandfather also taught all the grandchildren to drive on the way to the location. After arriving at the site, Jeri would go "exploring" in the area looking for rocks, etc. until she heard grandad honk the car horn to let her know he was ready to leave. When she graduated high school Jeri went to college at Texas Tech where she majored in Geology for three years. In the fourth year she changed her degree to English, got married, and joined her husband who was entering the U.S. Army. Jeri holds a Batchelor of Science Degree. "I believe my appreciation of the wonder of our natural landscapes was my inspiration for the degree. Farmers and ranchers are the amazing folks I enjoy working with."